Robin took up guitar at around 11 and quickly moved into playing Rock, Blues and Jazz. Robin studied classical guitar at Napier University Edinburgh with Rodger Quinn and then continued his training at the RSAMD in Glasgow studying with Phillip Thorne. Whilst studying at the RSAMD he attended master classes with David Russell and Turibio Santos and played at a series of workshops with pianist Stan Barker (Digby Fairweather). On leaving, Robin played professionally with bands and groups ranging from Country and Blues to Rock, Metal and Funk to Jazz and fusion. In addition, Robin continued his classical recitals and guest appearances at music and guitar societies throughout Scotland. He took up guitarist slot with the Forth Dimension Big Band for a number of years whilst continuing to play with The High Society Jazz Band and top band Live and Kicking. Robin also played on a number of sessions with a variety of projects including adverts and radio jingles and a ‘Scotland World Cup Football Anthem’. Robin continues to play professionally with ensembles and projects at a variety of events and corporate functions throughout Scotland. He has featured at Jazz Festivals, Guitar Festivals, Celtic Connections and has been guest lecturer and teacher for a number of Guitar and Jazz workshops and seminars throughout the UK. Robin has written for and played with Glasgow Symphony Orchestra and The Royal Scottish National Orchestra. In summer 2014 Robin UK premiered Jim Hall’s Suite for Jazz Guitar and Strings in Edinburgh. Robin writes and records with The Jazz tigers and has recently recorded and toured with the Robin Robertson Band. The Blues Band project has had international acclaim with reviews and radio play in Europe, Australia and USA . The band has played at festivals throughout the UK and Europe. Robin continues to lecture at Edinburgh College in Guitar studies, Jazz improvisation and theory and harmony. Robin has over 30 years teaching and playing experience. Robin has taught in school, college, University and at home with a successful private teaching practice. He has presented and continues to present students for a range of exams including National 4 and 5, Standard Grade, Higher, Advanced Higher, HND, Degree and Masters programmes. He has been actively involved with developing materials, examining and course development. In addition, Robin continues to present students in ABRSM, Guildhall, London College, Rock School, Trinity Music exams. He has been integral in developing, writing, setting up, coordinating and running a number of courses for Stevenson College Edinburgh, Napier University Edinburgh, Scottish Qualifications Authority and The Lothians Education Departments. Recently, Robin has been instrumental in developing the guitar department at Edinburgh College Edinburgh, offering courses from National Qualification to Degree. In addition, he helped co-ordinate an International Guitar Festival, which took place in Stevenson College at Easter 2004. In addition he is an associate lecturer with Abertay University and registered tutor with RGT and Trinity College and Rock School. 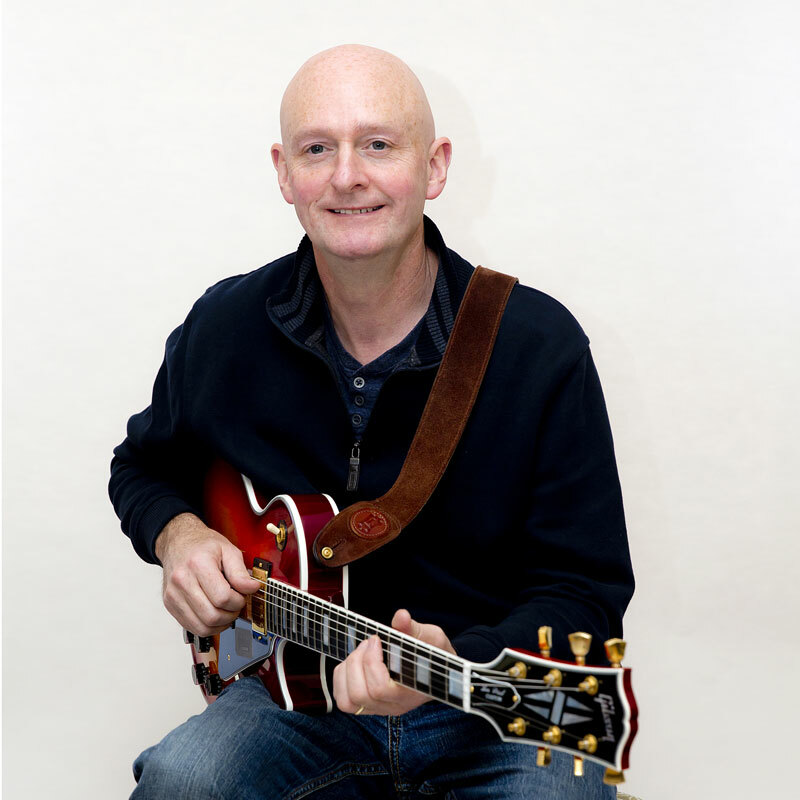 Robin lectures in Guitar Studies and specialist areas with Jazz Theory and Harmony and Jazz Improvisation with an emphasis on teaching guitar and performance to 3rd and 4th year degree students. Robin has taught hundreds if not thousands of guitarists over the years. Many of whom are now Guitar Tutors, Class Music Teachers, Lecturers and professional performers. Yet, they still return for lessons years later. Robin is equally proud of all the performers he has had the privilege to tutor who have taken part is such prestigious events as T in The Park, Isle of Wight Festival, Celtic Connections, Glastonbury, Wickerman, Loch Lomond and Ozz Fest, Virgin Festival, Edinburgh and Glasgow Jazz Festival.